She plays with a quiet and confident approach – as one can clearly see by watching her play. She plays for not only herself but her team – which is clear when she talks about team-team-team. She spends a good part of her matches working on her game and not worrying about the score – let’s face it, there is nothing to worry about. And the results are off the charts – as one would expect. 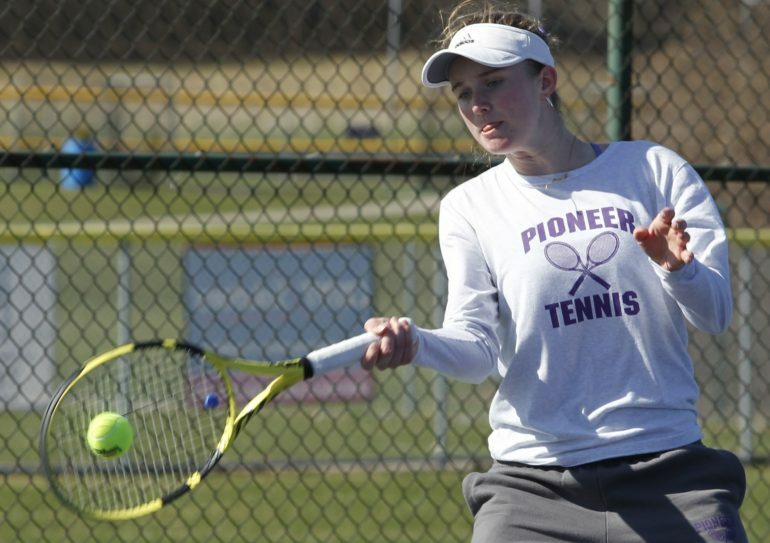 Welcome to Kari Miller’s tennis world where the Pioneer junior is clearly one of the best – if not the best – singles player in the state. Miller won the No. 1 singles state finals as a freshman before taking last year off from Pioneer to play in elite tournaments all over the country. This year she is back to playing tennis with and for her teammates and friends. Miller entered her freshman year believing she “had a chance” at winning it all at states but also knew there would be some challenges to overcome. “I knew I would be facing some really good players,” she said. And there are two sides to a tennis court – physical and mental. MHSAA has a rule that prevents tennis players from playing more than two tournaments outside of the high school season and that just wasn’t going to fit into Miller’s plans. Even though she was only a sophomore, she was already serving up plenty of interest from colleges and wanted to get that figured out sooner rather than later so she hit the tournament circuit. It was all about playing against elite competition for the Pioneer junior. And it’s going to be a short trip. Miller can’t stop talking about the team, team, team. Miller, who also has played soccer and field hockey, started playing tennis when she was 3 years old and was playing tournaments when she was 8. “My dad’s sister was a pro and she was ranked professionally and was really good so it was kind of a family sport,” she says. Miller, who easily took first at Pioneer’s invitational on Saturday, is back with her Pioneer family and it’s easy to see how happy she is to be here. And when she’s done being there – across the street – she hopes to turn professional and follow in her aunt’s footsteps. “Assuming I have a good college career and keep improving, I will try to join the professional tour after college,” she says.